I can't say much as I'm deep behind enemy lines and I can't afford to blow my cover, so all I can say right now is that the C3G Heroes are known for following certain trends. Expect that to continue. OMG, gotta go...I'll try to say more later! The latest C3V release has ended with a bang, with 5 Unique Heroes added to the Valkyrie Generals' forces. In case you missed the release, check out the Books of Index to see all the new units and share your thoughts about them. The WOLF PACK is here at last!!! This week, we take a closer look at one of the HoSS maps: Moisture Farms! Check out the Holocron (HoSS's term for "Books") of the Moisture Farms map here. 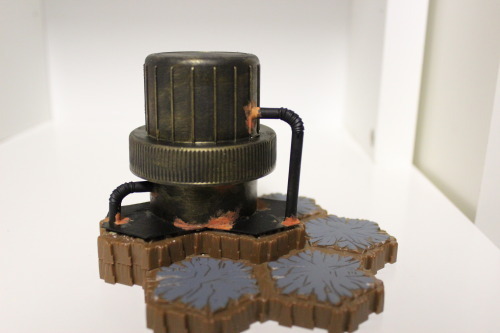 This week we're featuring a custom terrain piece by new member NosferatuPickles! This Sci-fi power core like thing is his first attempt at making custom terrain, and he's doing a pretty good job so far! Hopefully, we will see more of his work in the future in his thread. This week we bring you a new map by: superfrog! 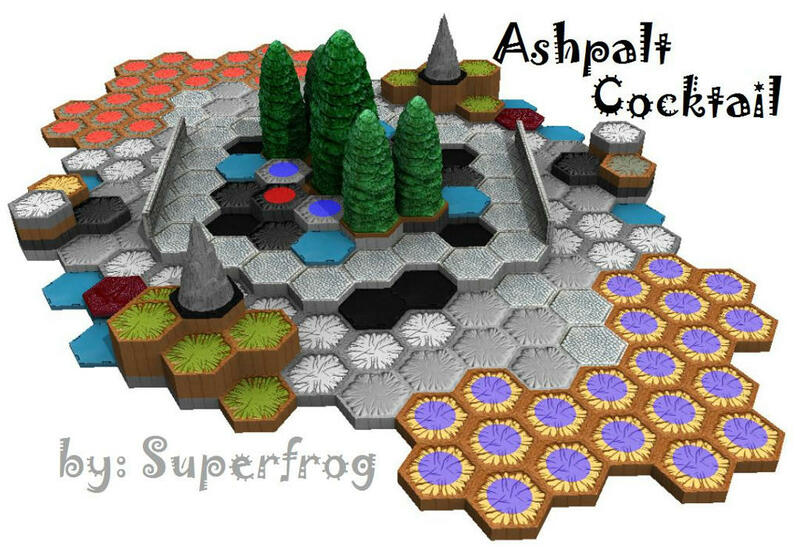 Asphalt Cocktail is a well designed map thrown together with one Road to the Forgotten Forest, one Marvel Master Set, and one Dungeon Master Set. With split close quarter starting zones, you can start off the battle quickly and fiercely, but still have in mind that more than half of your army is waiting and ready to spring into action on the other side of the map. Plus, with the height on each side and the shadow scattered throughout the battlefield, you can make it easy for your forces to hide but still strike when they need to. If you would like to see more of superfrog's maps, you can check out his map thread located here. 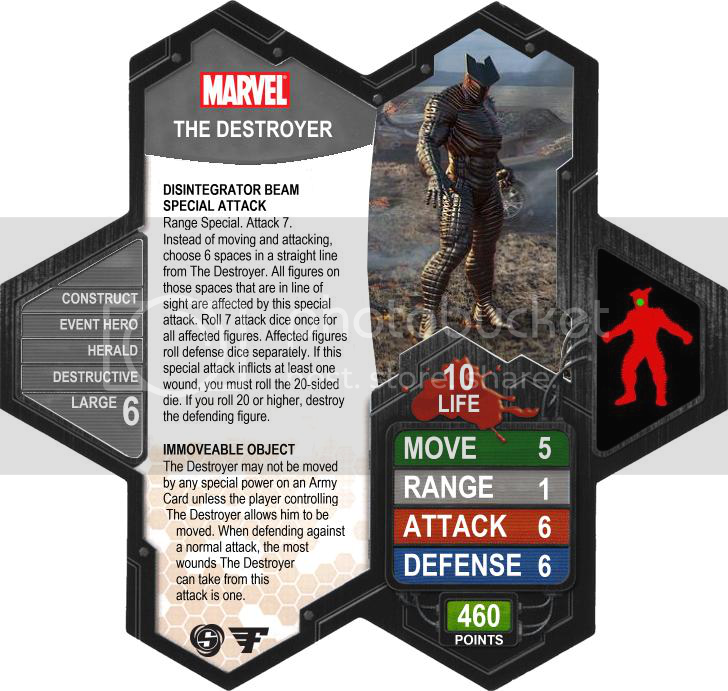 Today we bring you the Destroyer from the Custom Comics of Ibechief! This colossal being is impossible to move against it's master's will, and with its sturdy defense, this construct of Odin presents quite a challenge for anyone daring to challenge him. Ever get tired of scrolling through endless pages of random threads in order to find various custom projects? Well, thanks to lefton4ya you can now find them with ease in the Index of Custom Projects! Is there supposed to be anything in the C3G section? Ummmm.... yeah, I don't know what happened. I'll go see what I can do. There was no hold up with the articles. NS, I can't post the pic that was supposed to go in the C3G section. Would you mind posting it here? It's always GRRRREEEAT to see new things posted on the Front Page. Thanks guys for all your hard work and diligent efforts. I'm am forever grateful that this site keeps coming out with new things week after week. Thank you Truth for keeping us updated on all things Scape! Annndddd the winner is..... ZBeeblebrox!!! Darn, I kinda wanted to see El-T keep guessing. As always another great Week@HSers! I think that sci-fi power core thing would look great on a map, I'm gonna have to try and make one of those. That Destroyer sure looks like a beast, 6 defense, 10 life, and an Event Hero to boot. He will definitely be challenge for even the god of thunder Thor himself! Thanks to the Week@HSers crew for another great week! Now, a suggestion: you guys frequently write in first person, but nowhere in the article is it signed by the writer. So I never know who the heck is talking. It would be helpful if you put your name at the top of the article or signed it at the bottom or something.